E-Books - D.A.F. 's extensive material on the Talmud in eReader (handheld) format. Laz of Rashi - a comprehensive list of English words used in Rashi's בלע"ז translations. Tana'im & Amora'im (Heb) - Historical background of individual Tana'im & Amora'im. Chanukah & Purim Shiurim (H/E) - Rabbi Kornfeld's popular yearly Shiurim. Download Video/MP3 Shiurim - Download MP3/Video files from our collection of lectures! The Weekly Parasha-Page - Rabbi Kornfeld's unique inisights into the weekly portion & holidays. 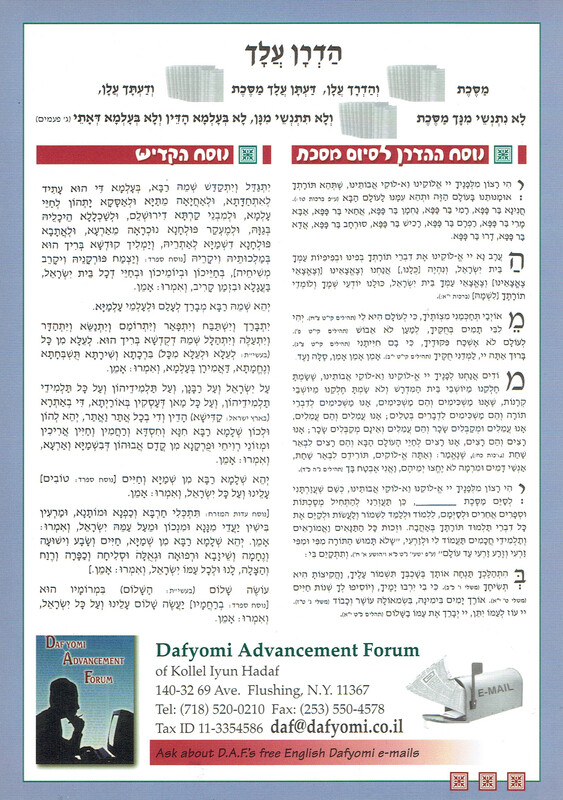 Yosef Da'as (Heb) - Our invaluable "Yosef Da'as" publication for any Daf in Shas. Quiz booklets - Handsome downloadable multiple-choice quiz booklets for choice Masechtos. See a full list of our prouducts.